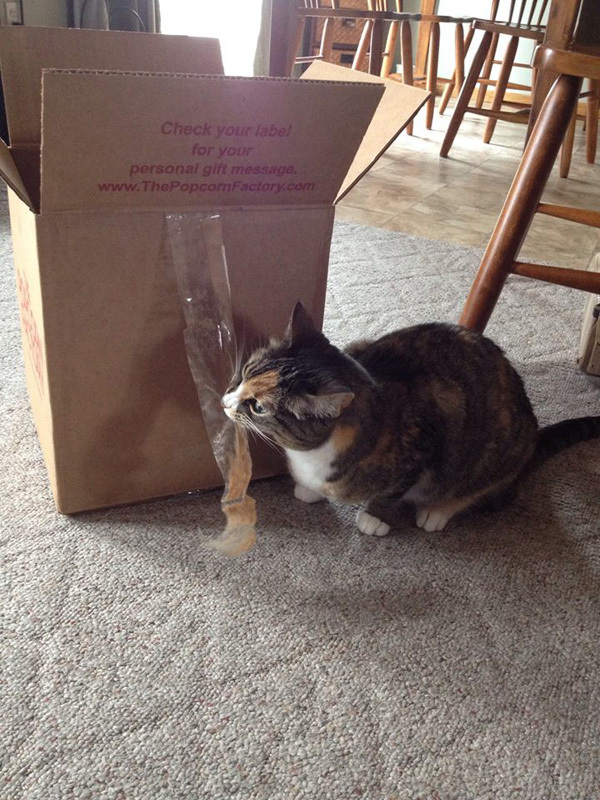 Packing tape that hangs from boxes, gift-wrapping tape, and even stickers -- Phoebe goes to any length to get her fix of the sticky stuff. My Phoebe has a confession to make: She’s a tape addict, and she’ll do anything to get a fix. 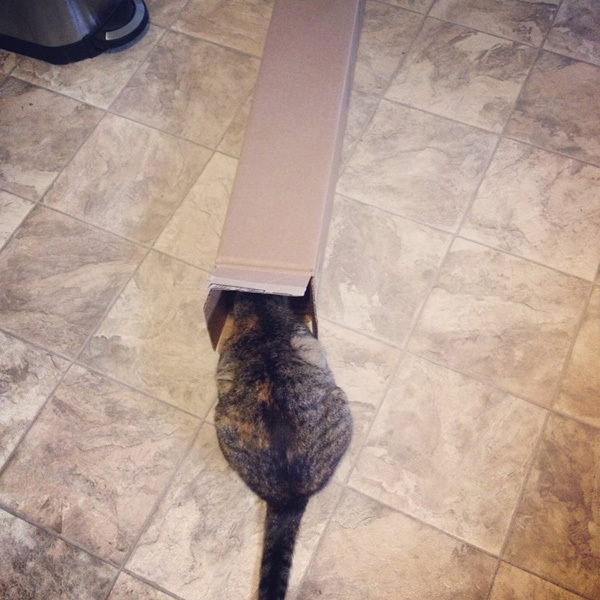 She obsesses over each packing-tape-sealed box, and gift-wrapping time makes her itchy. And she’s not above fishing used tape out of the garbage. In fact, she maniacally digs for it and then takes off like a bandit with the valuable booty. Of course I don’t allow her to eat tape — that would be irresponsible. I may be a little goofy once in a while (more often than not), but I’m not irresponsible. When we catch Phoebe going to town on a piece of dangling tape hanging off a box, she doesn’t immediately take off, even though she knows her tape-chewing is a no-no. In fact, she starts gnawing harder as we walk toward her, trying to chew as much as she can before we physically remove the sticky stuff from her mouth. Like any addict’s thought process, rules don’t mean a thing. Getting the fix is what’s important. Screw the law. 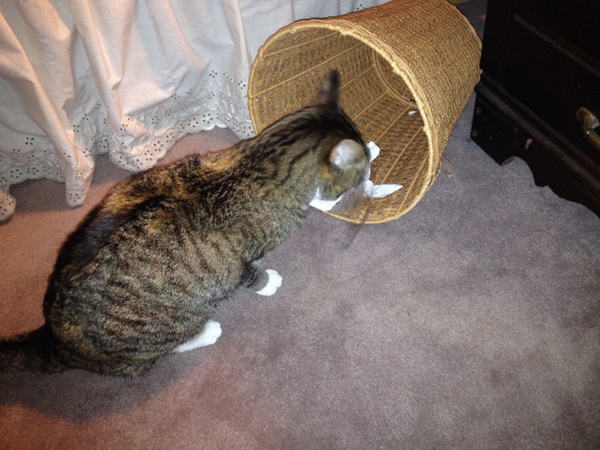 Like I mentioned, she goes as far as to tunnel through the contents of a wastebasket, searching for a precious piece of tape. It’s like she can sniff it from the next room. Seriously — sometimes I’ll catch her with her adhesive treasure and wonder, “How the heck did she even know that was in the wastebasket? I really buried it this time!” Now I try and remember to place any leftover tape in the kitchen garbage can, which has a lid. You do what you have to do when saving an addict from herself. Since she was a kitten, Phoebe’s done what our family calls “hot-footing.” When she’s stolen something she knows she’s not supposed to have, she bolts like a race horse with the contraband in her mouth. She’s looks like a flash, especially if I only see her out of the corner of my eye. One of her nicknames is “Hot-foot.” She looks quite hysterical when she’s hot-footing — I shift between laughing and frustration when I’m chasing her. And she’s fast. I’ve injured myself while in pursuit of Hot-foot. Tape is probably the No. 1 object with which she hot-foots. Sometimes the piece of tape is more than a few inches long, and it flies behind her like a banner behind a little plane. Of course she tries to hide with her acquisition, and then there’s the comedy of trying to blindly obtain the tape from the hideout. 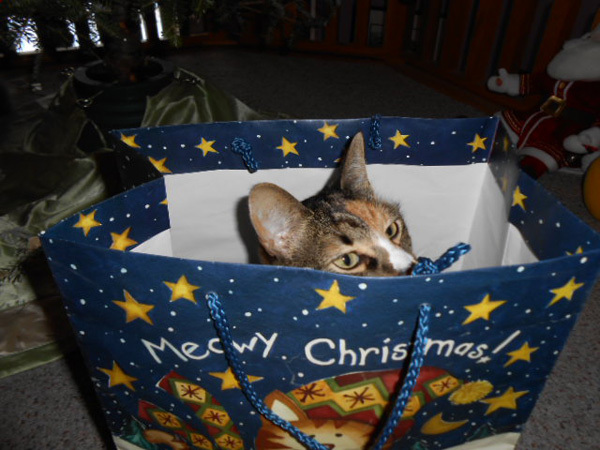 And gift-wrapping with Phoebe in the same room? Forget about it! Others have told me their cats have a similar obsession with the sticky stuff, but some cat parents look at me blankly when I describe Phoebe’s crazy behavior. Your cat does what? What is it about the tape? And to be truthful, it’s not only tape — she also goes nuts for stickers, bandages or anything adhesive. We really have to be careful when monkeying around with those “dangerous” substances. Our little hot-footing addict will find them. 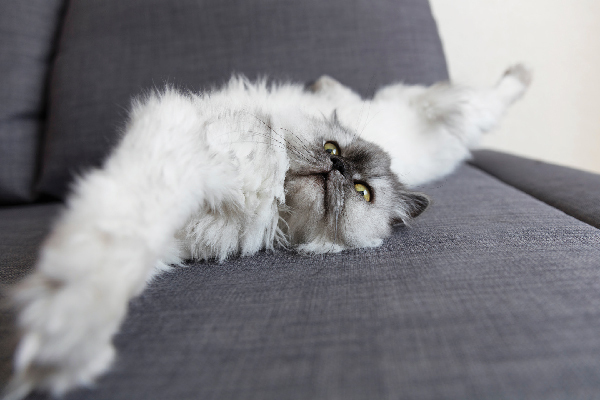 Does your cat go crazy for tape? Let us know in the comments!